Mme Anold Renard is a mother of 10 children who moved from a small village in the mountains to the costal village of Titanyen, Haiti for better education prospects for her children. 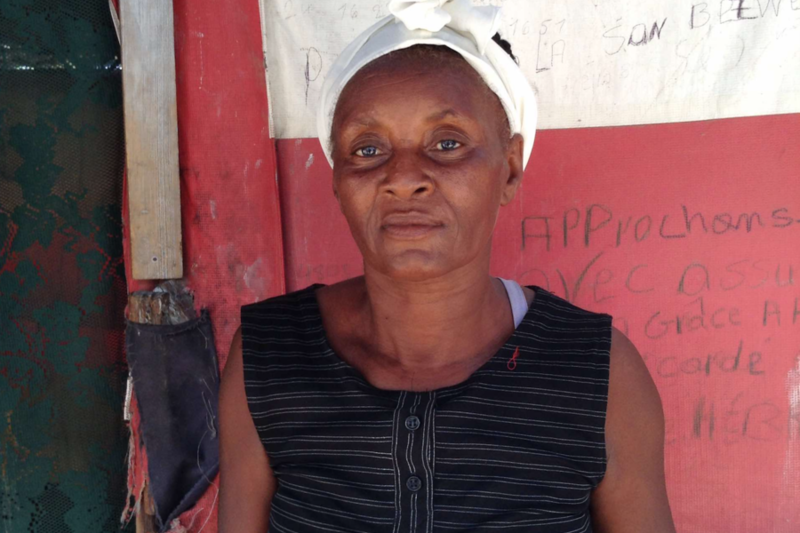 Due to financial circumstances, only 2 of her children live with her. The rest of the children live elsewhere. Although Mme Anold is not in the best of health, her spirit of self-reliance showed when she alone dug the foundation under the tarp tent. Though she did her best, the tent floor still turns into a muddy mess when the rains flood the area. Though life is difficult in the tent, she perseveres so that 2 of her children can attend school. Mme Anold dreams of the day when all of her children can live together under one roof and attend school in Titanyen. Together we can grant this family the security of a permanent home that brings with it the opportunity of education for all these young minds to bloom!